Where is, or What is, Margaritaville? Where is Margaritaville? Rather, what is Margaritaville? Margaritaville is a feeling, not a place. "Margaritaville" is the name of a song that Jimmy Buffett wrote and recorded with his Coral Reefer Band in Key West, Florida. The song was a major hit in 1977, reaching #8 on the Billboard 100 list. The song is named after the "Margarita Cocktail," with lyrics that reflect the relaxed laid-back lifestyle that was characteristic of tropical Key West in those years. 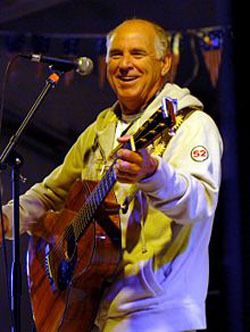 In subsequent years, Jimmy Buffett wrote and recorded many hit songs including: "Volcano," "Come Monday," "Changes in Latitude," "Cheeseburger in Paradise" and "Christmas Island." He toured heavily and became a popular in-demand concert draw. However, Jimmy Buffett is best known for "Margaritaville," and his easy-going beach bum image. 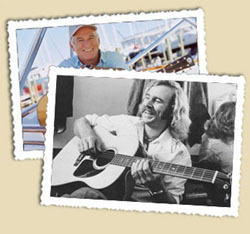 Jimmy Buffett has parlayed the "Margaritaville" song's popularity into numerous successful "Margaritaville" branded commercial ventures that started in 1985 with his opening of his first Margaritaville restaurant in Key West Florida. He now has shoe shops (Soles of the Tropics), a line of frozen foods, Margarita Salsa, Margaritaville Margaita Mix, apparel and souvenir shops and the Cheeseburger in Paradise restaurant chain. He also has LandShark Lager, in cooperation with Anheuser-Busch. Recently, some major Gaming Companies have contracted with Jimmy Buffett to employ his branded "Margaritaville" theme, with its laid-back lifestyle and implied relaxed state of mind, in their casinos. Harrah's Entertainment Inc. is developing the Margaritaville Casino & Resort in Biloxi, Mississippi featuring a Jimmy Buffett-inspired theme. The resort will be developed on 46 acres on the site of the Grand Casino and Magic Casino that was destroyed by hurricane Katrina. Construction is scheduled to be completed by the spring of 2010. Coastal Marina, LLC, a New York-based gaming venture, was to acquire the Trump Marina Hotel Casino in Atlantic City. Coastal Marina planed to refurbish the casino and re-brand the Trump Marina into a Jimmy Buffett-inspired "Margaritaville." Jimmy planned to help them bring his laid-back, beach-bum, lifestyle of soaking up the sun and drinking margaritas to Atlantic City. Because of the poor economy, that planned project was canceled. Instead, it became a Golden Nugget. 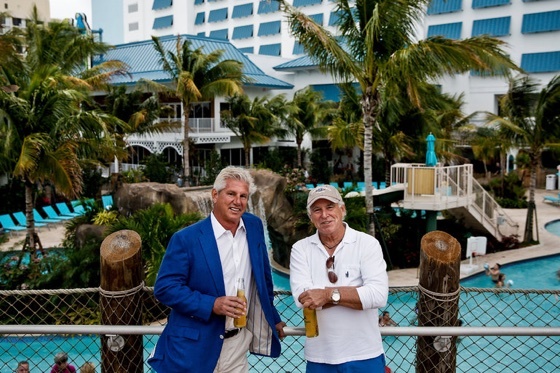 A new Margaritaville opened at Resorts in Atlantic City on May 24, 2013. It includes a Margaritaville restaurant, a Five O’Clock Somewhere Bar, a themed gaming area, two retail stores and a coffee shop on the land side of the Boardwalk. It also includes a Jimmy Buffet LandShark Bar & Grill situated on 200 feet of beach frontage, that has a year-round, full-service bar and restaurant on the beach. 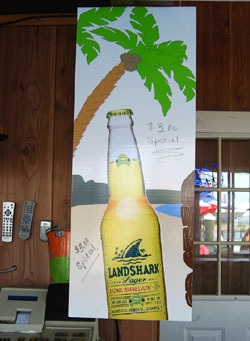 The Landshark Bar and Grill is built on the footprint of the former Steeplechase Pier. The Parrot Heads now have a new place to play! 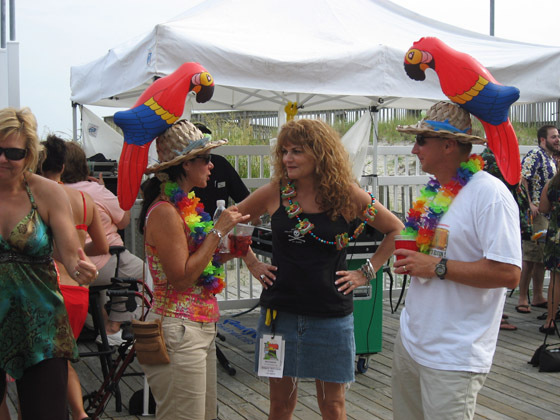 Jimmy Buffett's fans call themselves Parrot Heads. There is a series of officially sanctioned Parrot Head Clubs across the nation. The local branch is the Jersey Shore Parrot Head Club. Check them out at Jersey Shore Parrot Heads. Some Parrot Heads are shown below. 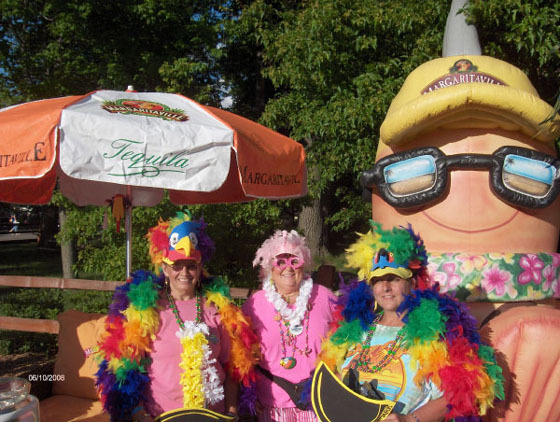 Jimmy Buffett continues to grow and expand his brand. His newest showstopper, a 17-story hotel, in Hollywood, near Miami, has three pools, a full-service spa and eight restaurants, including a seriously upscale steakhouse. Over near Orlando, work has started on his $800 million family resort, which will include a 12-acre water park and 1,200 homes priced at up to $1 million apiece. His company, which had $1.5 billion in sales last year, is introducing a line of jewelry. He has one of America’s fastest-growing craft beers. 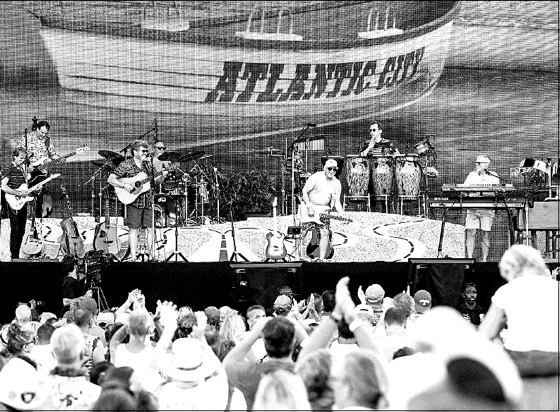 Jimmy Buffett's concert tours continue to be extremely popular. He often performs in Atlantic City. Photo by M. Falk, Philadelphia Inquirer staff photographer.